Boy and Girl Scouts walked with heads high and backs straight through a Knights of Columbus honor guard formation at the Catholic Committee on Scouting’s Religious Award Ceremony Sept. 7 at Our Lady of Mercy Church in Baton Rouge. This contingent was recognized for embracing core values of the Catholic Church and scouting: Go out into the world, learn who your neighbors are and serve them. Many involved with scouting say it is a natural extension of their faith lives and love for country and world. Scouting has long been part of the Lenny Long family. Long, now a Baton Rouge resident, was a Cub Scout, Boy Scout and Explorer at St. Dominic’s Church in New Orleans. His father was a Boy Scout leader and his mother a Girl Scout leader. His two brothers were Boy Scouts, and three sisters were Girl Scouts. Long earned the Parvuli Dei, Ad Altare Dei and Pope Pius X Catholic religious awards. He is an Eagle Scout. Long’s son, John, now a student at Louisiana Tech in Ruston, became a Tiger Cub in Cub Scout Pack 34 at Trinity Episcopal Day School. Lenny Long served as cubmaster. John Long moved to Boy Scout Troop 7 at St. Aloysius Church in Baton Rouge, and his father eventually became scoutmaster. Lenny Long then started Sea Scout Ship 7, which was chartered at St. Francis de Sales Catholic Deaf Center. Melanie Long has served as Cubscout and Webelos den leader. She encouraged her son to participate in scouting because she saw the positive aspects of scouting. John Long went on monthly camping trips, summer camp and yearly high adventure trips. These excursions included backpacking at Philmont Scout Ranch in Cimarron, N.M., canoeing in the boundary waters north of Ely, Minn. and sailing in the Florida Keys. 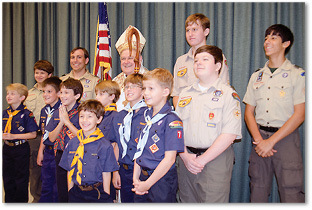 The Knights of Columbus gave instructions and visited with scouts who would be presenting the colors during the Catholic Committee on Scouting Religious Award program. Lenny Long became involved with the Catholic Committee on Scouting to teach religious emblems to scouts. 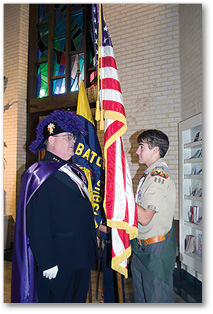 “Many of the values and morals taught in scouting are the same as those taught in the Catholic Church,” Lenny Long said. Two main principles taught by scouting is service and working together, stated Lenny Long. The service projects allowed Lenny Long and his son to put beliefs into practice. John and his troop worked under his father’s leadership after Hurricane Katrina to off load private aircraft at the Baton Rouge airport to support the centers for evacuees from New Orleans. Many unique opportunities to explore the United States are also made possible through scouting. Lenny Long led a contingent of Boy Scouts from the Order of the Arrow, scouting’s honor society, to work with the U.S. Forest Service and build mountain bike trails in Grand Teton National Park near Jackson Hole, Wyo. Another project involved working in a community in West Virginia near Boy Scout’s newest high adventure base, the Summit Bechtel Reserve. “We also built trails in the national park to bring additional mountain biking events to this area,” Lenny Long said. Among the favorite trips scouts make is to the National Boy Scout Jamboree. Lenny Long served as Scoutmaster for one of the Istrouma Area Council’s troops at the National Jamboree in 2013. He also served as a leader for the National Jamboree at Fort A. P. Hill in 2005 and 2010, which his son also attended. Scouting further teaches people to learn more about humanity by embracing cultures beyond their own borders. John Long and his father attended the World Boy Scout Jamboree in London in 2007, and in Sweden in 2011. Lenny Long was on the international service team. The 10-day jamboree is a cultural-exchange from scouts around the world. As was the case for his father, scouting provided John Long with leadership and service opportunities. He earned his Parvuli Dei, Ad Altare Dei, and Pope Pius X religious emblem awards. He also earned his Eagle Scout, Silver Award, the highest award in Venturing, and Quartermaster Award, the highest rank in Sea Scouts. He worked on staff at Avondale Scout Reservation in Clinton and as a wrangler at Philmont Scout Ranch. John said he was very interested in conservation, and led several projects for his Boy Scout troop. Furthermore, scouting provides families with time to spend together. The Long family went to Philmont Scout Ranch in 2012. Lenny attended the international representative course while Melanie participated in the spouse program and visited in the area. John was a wrangler. “One of the highlights was a hike to Lover’s Leap at 4:30 a.m. to see the sunrise in the canyon,” said Lenny Long. He is currently assistant council commissioner, international representative, and member of the executive board of directors for the Istrouma Area Council of the Boy Scouts. Many families also share a rich history in Girl Scouting. Nathalie Roy Mitchell, leader of Junior Girl Scout Troop 10234, said her mother was a Girl Scout leader when she grew up. She talked about how scouting taught her the importance of working with the community and collaboration of her peers. Mitchell wants her daughter, Arizona, a member of her troop, to have the same experiences she had. “It’s a very good value,” said Nathalie Mitchell of the opportunities Girl Scouting provides for girls to practice values that are also embraced by the church. Mitchell said she is proud of her daughter for taking initiative in projects and developing her leadership skills. Arizona, who received the Family of God Award at the awards ceremony, said she takes seriously the Girl Scout motto, “Be Prepared,” by being ready to take on projects that improve people’s lives. Triplets Allison, Rachel and Kelly Dupuy, members of Girl Scout Troop 10160, who each received the “I Live My Faith Award” at the awards ceremony, discussed how scouting taught them to be better citizens in their community and members of their church parish, St. George Church in Baton Rouge. Allison Dupuy said one of her favorite projects was assembling lunches for the needy served by the St. Vincent de Paul Society. She said it has made her more thoughtful about the plight other people face. Likewise, Kelly and Rachel Dupuy said they are motivated to serve as they positively touch people’s lives. Smiling at each other as they conceded that it can be challenging to be siblings in the same troop, the Dupuy sisters conveyed that it brings them closer as they recognize each other as sisters by blood and by their missions as Girl Scouts and sisters in Christ. 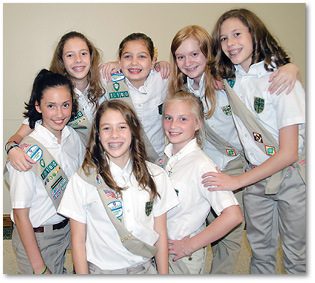 Girl Scouts gathered to congratulate each other and have their picture taken together by their families following the Catholic Committee on Scouting’s Religious Award Ceremony Sept. 7 at Our Lady of Mercy Church in Baton Rouge. 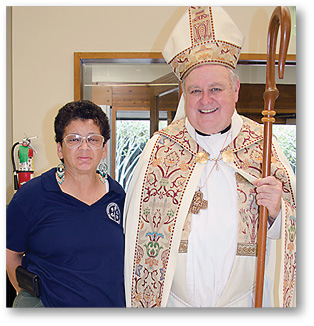 Bishop Robert W. Muench presented Nancy Simien with the St. George Emblem Award, the highest adult achievement in Boy Scouting.